Ever popular display unit for collectors of antique, traditional and celebratory 3 piece sets. Made from 3mm steel, the plate sits at rear whilst the cup sits on the saucer at the front. 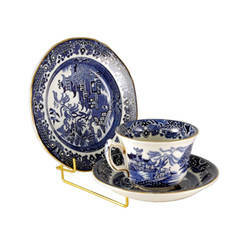 Can also be used as a cup and saucer stand or a plate and mug stand. Available in Gold and White.